Cue Card and Joe Tizzard on their way to victory in the Betfair Chase during the Betfair Chase Festival at Haydock Park Racecourse, Newton-le-Willows. Bobs Worth and Barry Geraghty, the Cheltenham Gold Cup Winner, in the Betfair Chase during the Betfair Chase Festival at Haydock Park Racecourse in November 2013. “We are delighted that jumps racehorse owners rate our racecourse so highly. The whole team goes out of its way to welcome owners to Haydock Park. Without racehorse owners, there would be no horse racing industry and we warmly welcome them as customers. Members were asked to rate the largest racecourses in England, Scotland and Wales after visiting them. They judged each track on a range of experiences, from ticket allocation, facilities, bar, food and drink, through to parking. Koukash Backs Hock & Horse! Salford rugby league club's owner Marwan Koukash has hit out at England's treatment of Gareth Hock. Hock was kicked out of the national team for a breach of discipline. Meanwhile, Mr Koukash's horse is one of the favourites to win the Melbourne Cup and be the first British horse to do so. Campaigners say they're still concerned over safety following the deaths of two horses at Aintree. The League Against Cruel Sports is calling for organisers to bring the Grand National meeting to a halt. Aintree in Liverpool - home of the Grand National. Credit: PA Images. None of the 40 horses involved in this year's steeplechase died or wee seriously injured but Battlefront and Little Josh died in other races. The animal welfare charity claims the total number of deaths during the three-day Aintree meeting is 40 since 2000. 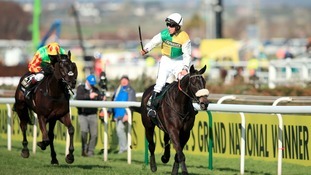 24 horses have died on the Grand National course itself.